An artist's impression of the seven planets of the TRAPPIST-1 system. Most are rich in volatile materials such as water. The seven planets orbiting the ultracool dwarf star TRAPPIST-1 are mostly rocky, with some potentially holding more liquid water than Earth. New research reveals the density of the worlds within this crowded system to a greater precision than ever before. The findings reveal that some of the planets could have up to 5 percent of their mass in liquid water form, about 250 times as much water as found in Earth's oceans. 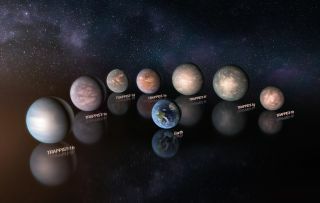 In addition to narrowing down the composition of the exoplanets, the researchers also found that one of the worlds could boast some familiar characteristics. "TRAPPIST-1e is the exoplanet which is most similar to Earth in terms of mass, radius and energy received from its star," Grimm said. Intrigued by the system, Grimm and his colleagues decided to measure the system using a technique known as transit-timing variations (TTVs). By observing small variations in the amount of time it takes a world to pass between its star and our viewpoint, called a transit, TTVs allow researchers to make some of the most sensitive observations of planetary masses and densities. "Using TTVs is currently the only method to determine the masses and therefore the densities of planets like the TRAPPIST-1 system," Grimm said. Other methods don't work because the planets are too lightweight or the star is too faint, he said. The method allows astronomers to determine the mass of the planets relative to the stellar masses. Combined with the radii measured as the planet transits its star, the technique reveals the densities of each world. The researchers relied on data captured by NASA's Spitzer Space Telescope and several of the European Southern Observatory's instruments in Chile to make detailed observations that could reveal the variations in planetary orbits. If one planet traveled around its star alone, then the only gravitational pull it would feel would come from the star. But when a system holds two or more worlds, the planets interact gravitationally, tugging on one another with a force related to their masses. These shifts depend on the planets' mass, distance and other orbital parameters. At the same time, crowded systems like TRAPPIST-1 make it more challenging to tease out the effects of individual planets, as each world tugs somewhat at its neighbors. The TRAPPIST-1 planets are easier to measure because they orbit in sync; together, the seven exoplanets form a resonance chain connecting them all together and suggesting a slow, peaceful evolution. "The TRAPPIST-1 system is special because all the planets are in a resonance condition," Grimm said. Grimm took a simulation that he had previously used to calculate planetary orbits and adapted it to TTV analysis. Using more than 200 transits, his team modeled the mass and densities of the worlds, simulating the orbits of the planets until their modeled transits matched what was observed. The researchers found densities of the worlds ranging from 0.6 to 1.0 times Earth's density. The seven worlds are rich in water, with water levels on some reaching as high as 5 percent of the total mass. In comparison, only about 0.02 percent of Earth's mass is contained in water. TRAPPIST-1b and c, the innermost worlds, are likely to have rocky cores and be surrounded by dense atmospheres thicker than Earth's. Lying close to their star, the hottest worlds probably have thick, steamy atmospheres, while the most distant ones could be covered in ice. TRAPPIST-1d is the lightest of the seven planets, weighing about 30 percent of Earth's mass. Its low mass could be caused by a large atmosphere, an ocean or a frozen icy layer. TRAPPIST-1f, g and h lie far enough from their host star that water could be frozen into ice across their surfaces. The thin atmospheres would probably lack the heavier molecules found on Earth. Then there's TRAPPIST-1e, the most Earth-like of the group. As the only planet slightly denser than Earth, TRAPPIST-1e likely has a denser iron core, and may lack a thick atmosphere, ocean or ice layer. The researchers cautioned that the new results, which were published in the journal Astronomy & Astrophysics, do not directly say anything about habitability. However, by helping researchers to better understand the conditions involved in the crowded system, the new research helps to make strides in understanding whether the worlds may be capable of supporting life.